We had previously learned who all of these actors were going to be but this is the first time we see them in costume. What do you think? 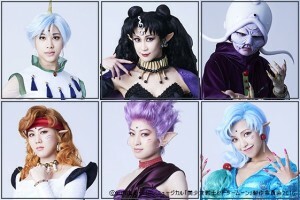 There has also been a cast change, which was mentioned in our last update, where Hikari Kuroki who was originally cast as Sailor Mercury was replaced by Yume Takeuchi. This was said to have simply been because of “cast circumstances” without specifics. I’ve learned some details about what may have prompted this. She posted on Twitter that she was leaving because of complaints. Some believe she may have been removed from her role for having posed as a gravure model in the past, which means that she did modeling in clothing such as revealing swimsuits. I also saw comments suggesting she had changed her name since then. I do not know the exact nature of all of her previous works so I can not comment on the specifics, but it seems unfortunate for something like this and the public shaming that ensued to have caused problems with her career. Many other actors who have been affiliated with various incarnations of Sailor Moon have done this type of work so it’s hard to say if this is the actual reason for her leaving and we will likely not be getting anything in the way of official confirmation if this is the case. 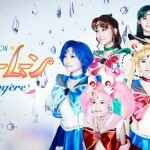 Some details about this come from an article from Yahoo Japan. You can read a translation of this and her tweet on the Ai No Message Tumblr page. 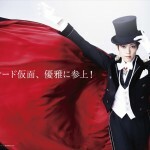 This musical, which covers the Dream arc of the manga, will be playing in Japan in October and November of this year. 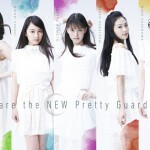 Additional images can be found at 25news.jp. 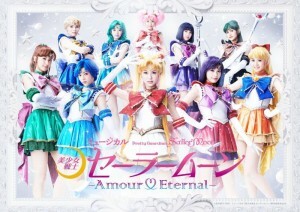 This entry was posted in Sailor Moon Musicals and tagged Amour Eternal, Fish Eye, Hawk's Eye, Helios, Hikari Kuroki, Nehelenia, Sailor Mercury, Tiger's Eye, Zirconia by Adam. Bookmark the permalink. Hoping that’s a Proplica Moon Kaledioscope in her hands. Wow…. 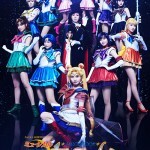 Am I the only person who’s a little creeped out by the “new” cast literally being doppelgangers of the “old” ones” When I saw that picture I was like, why did they put the new Sailor Moon together with the old “inner” soldier cast? Nope, they also have exactly the same facial structures. They did it on purpose. So, yes – when you go on and on about how “hot” or “cute” these actresses are with complete disregard for their talents and abilities – when you talk about how they’re “perfect” for their parts before you’ve even heard them talk – you ARE part of the problem. General agreement on this. I didn’t go out of my way to see what she’d done but some of the stuff I found out about Japan while the live action series was out was so far outside of what is considered acceptable in the west that I found it shocking. All said if someone has a problem with this, as some fans who were vocal in objecting to this choice of actress were, the way to promote change is hardly in shaming a young model who’s more of a victim and product of this than anything. Understanding of course as an outsider looking in that I’m really only seeing a small fraction of a larger culture which I don’t know much about. I’ll admit to being a big fan of Keiko’s an buying a lot of her photo books over the years but the contents of these were tame by western standards and nothing like what some other models have done. I can’t imagine the bullying these actresses might have gone through. As much as I like the Japanese culture and their contributions to the world, their society is still backwards in regards to tolerance and acceptance of liberal ideas. Anything out of the norm is done underground. I know because I have a close friend living there. I wonder if this means there will be a season 4. I’m shocked they still haven’t said anything.